Controversial student leader Mcebo Dlamini is facing criminal charges from the South African Jewish Board of Deputies (SAJBD). This comes after Dlamini, now former acting president of the Wits Student Representative Council (SRC), referred to Jews as â€œdevilsâ€, saying that â€œthey are good for nothingâ€, â€œhypocriticalâ€ and â€œuncircumcised in heartâ€. The comments were made on his Facebook page, and most recently on PowerFM. 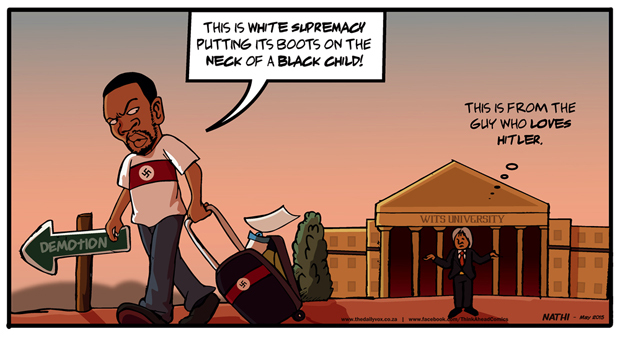 Surprisingly, while some concur with the universityâ€™s decision to oust him from the SRC, Dlamini and his Hitler-loving comments still have the support of many students. FIRDAUS KHAN rounds up six reasons why some students still stand byÂ Dlamini. 1. Because he’s black. Wait … what? Mcebo Dlamini needs our support! He has many errors, but he is Black. He needs our support! Are we done tipexing Mcebo Dlamini out of the shapeshifting and Ãœber progressive 1 Million 1 Month campaign? The flaws with Dlaminiâ€™s stance have already been pointed out, yet he and his supporters continue toÂ defend this perspective vigorously. Whatâ€™s your take on Dlaminiâ€™s decision to stand by his anti-semitic statements? Let us know in the comments orÂ on Twitter. – Featured image: By Nathi Ngubane. Firdaus Khan is pursuing a master's degree in media studies at Wits University. She has a keen interest in the politics of race and is happiest when travelling.